Help us keep "Making Dreams Come True" in Idaho! In light of the recent decision by Congress to eliminate the NRCS's funding for the RC&D program Nationally. We need your help. The RC&D's were created by an act of Congress 40 years ago, and this recent budget action does not negate our existence. Instead, it eliminates the federal funding for an RC&D coordinator and basic operational funding by the NRCS to the RC&D program. Here at High Country, we have been in business for 32 years as a 501(c) 3 non-profit. We look forward to the future with optimism and renewed enthusiasm. As ever, our programs will continue to provide valuable assistance to farmers, ranchers, forestland owners and communities in our region. But now we need your help. From Dreams to Reality; providing the "know how" to help communities improve quality of life one project at a time. We understand that you worked hard to earn the money you're donating to High Country. So, we make sure every dollar you donate works just as hard. 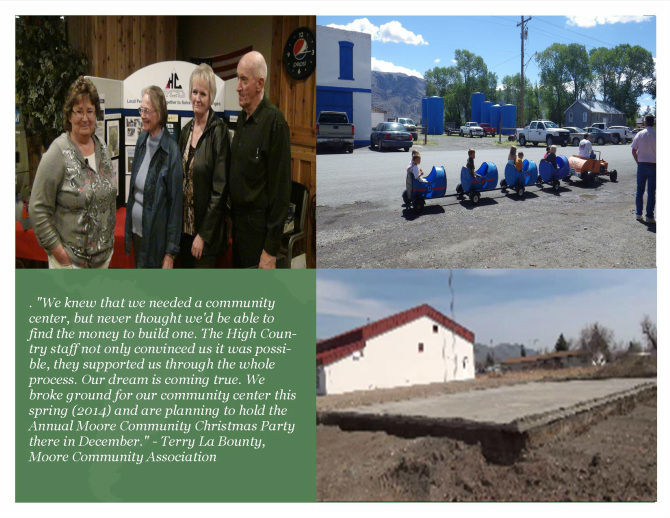 When you donate to High Country RC&D, ninety cents of every dollar is spent directly supporting projects. The remaining $0.10 supports the things that "keep the doors open"; insurance, office space, computers, printer, internet, phone and fiscal management. High Country's support and education is provided to groups at no, or very low cost! When you donate you help local project dollars go directly to making that project happen. Your donation to High Country will help your friends and neighbors improve the quality of life for your community. Just ask the people of Moore, Idaho. High Country staff taught them how to develop a project plan, find resources they didn't know they had, and write grants to make up the difference. 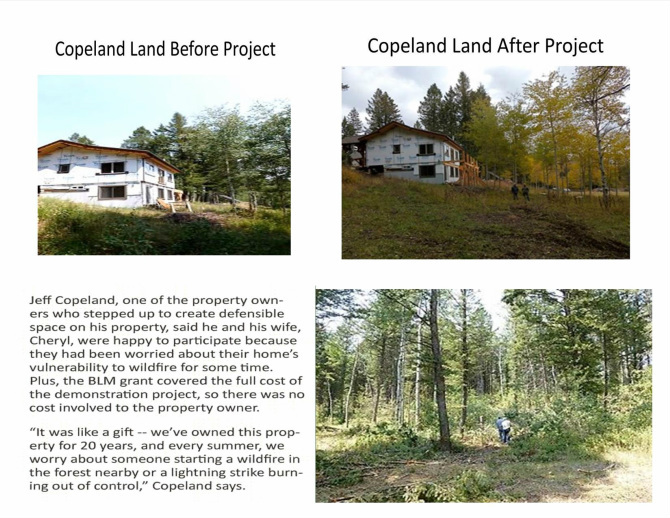 Wild land Urban Interface Community Assistance: Wildfires pose a significant threat to life and property for individual landowners and communities within the nine county HCRC&D area. HCRC&D has been partnering with the Bureau of Land Management for the last 6 years to assist landowners reduce their risk from Wildland fires, and assisting our sponsors to implement their existing County Wild Fire Protection Plans (CWPP). Your donation can be the catalyst that helps people work together to tackle regional issues and turn them into advantages. Here's an example: Water is life, especially here in southeast Idaho. We turn on a tap and fill glasses, washes clothes & cars, and waters our lawns. We use it for growing crops and generating electricity. It's important to our economy; drawing tourists from all over the world. We swim, fish, and boat on our streams and reservoirs. Yet in some years, Mother Nature is stingy. She doesn't drop enough snow or rain, causing drought. A group of Counties and Irrigation Companies wanted to take advantage of a proven technology (Cloud Seeding) that would "capture" more water from the winter storms. They asked High County for help. High Country has coordinated and managed the funds for the project since 2001. There are now over 40 partners and the project collaborates with Idaho Power, who provides meteorologists and additional cloud seeding machines. In the 2013-14 winter season, the project "captured" about 190,000 extra acre feet of water (about enough to totally fill an area the size of Henry's Lake 30 feet deep).That water is stored as snow, high in the mountains, and will provide water all summer long. High Country is an IRS recognized (501(c) 3), non-profit organization, that is incorporated in Idaho. We serve Bonneville, Butte, Clark, Custer, Fremont, Jefferson, Lemhi, Madison, and Teton Counties in Idaho, and the Alta area of Teton County, Wyoming. We exist to support and educate (by doing) other non-profit organizations and community groups how to take projects from an idea to "on-the-ground" completed. If you can dream it, we can help you make it a reality! Our people are experts in project development, planning, and implementation; money and in-kind/volunteer tracking and management; federal, state, and private foundation grant writing, grant management and reporting. We "know" or "know how" to find: funders, resources, and experts your community needs to get projects off the ground and completed. And we'll teach you how to do this yourself!